Choosing best lift chairs or electric recliner chair for your friends, relatives, partner or yourself is not an easy choice. Do you or someone you care about have trouble getting in and out of a chair? If this is becoming an issue, then you might want to consider purchasing a power lift recliner (also known as power lift chair). There are various brands with many products, multiple specifications, and price range. Sometimes power lift chairs can be called wall huggers since some specific models, if necessary, can be leveled with the wall. They are available in different shapes, sizes, capacities and price ranges. The more the number of positions a particular chair lifter comes with, the more convenience gives to the user. Recliner chairs are made to help people giving them the option to get up and out of a chair without a struggle. Getting from a standing to a relaxed and seated or laying position with ease is very important, and we take it for granted. Electric recliners are typically controlled with a remote. They are very simple to use with one or two buttons. Controls for moving up or down and on Infinite chairs there will also be a button for footrest. 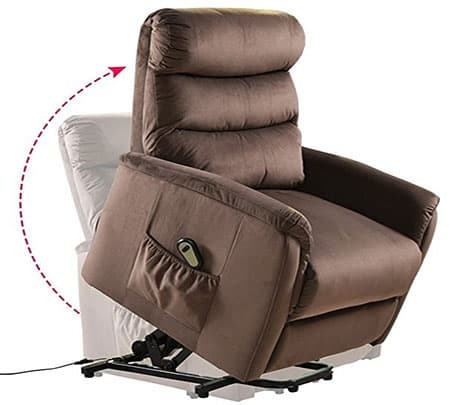 These chair lift recliners can provide a lot of relief and freedom for those that no longer have the strength or energy to get in and out of a chair multiple times a day. Best Lift Chairs – What Is a Lift Chair? As the name suggests, the power lift chairs are run by electricity and during power cuts by an integrated battery. The lift chair or recliner chair is designed to provide more natural life to those who need it the most. The standard lift chairs have multiple pockets on either side to keep essential things like newspapers, medicines, water bottle, spectacles, etc. Available in different colors, dimensions, and capacities each lift chair is designed with a specific style depending on the postures the user is supposed to make. There are three general types of lift chairs: two position lift chairs, three positions lift chairs, and infinite position lift chairs. 1. Two position lift chairs can go into the up position, sitting position and 15-degree recline position. They are very rare. They have limited mobility and cost about the same as a three position lift chair. It’s best to skip two-position lift chairs. The lowest two-position lift chair price goes around $599 when it is not on sale. 2. 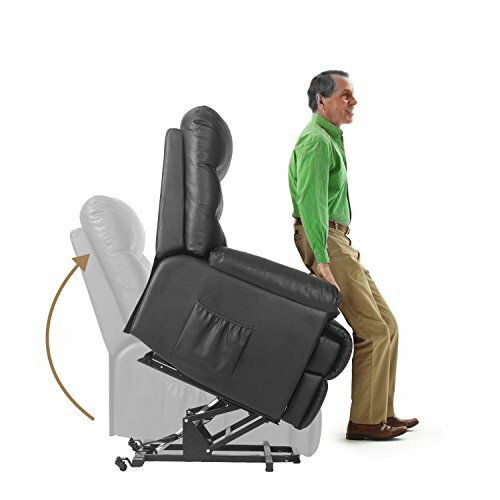 Three position lift chairs go into the sitting position, 15-degree recline position, 45-degree recline position, and up position. The price for a three position lift chair is generally lower than an infinite position lift chair. Three position lift chairs usually require less room and lower priced can be purchased in the $500-$600 price range. Three-position lift chairs that are over $1,300 should be avoided as that’s the average price for an infinite position lift chair. 3. Infinite position lift chairs can go from the sitting position to a full recline, where the chair lays flat. The footrest and back can be operated independently. Some models can go into the Trendelenburg position and zero-gravity position. The Trendelenburg position is where the feet are above the head. The zero-gravity position is where the head and feet are level, but the hips are below the hip and feet. Infinite position lift chairs are suitable for individuals who want to lie down while watching TV or use their lift chair as beds. It is also the most versatile of the three types. Infinite position lift chairs are split into two sections. Budget ones that are between $700 and $1,300 and luxury ones that are between $1,400 and $2,200. Usually, luxury lift chairs are made by furniture companies, not mobility companies. This often results in lower quality and durability lift chairs. We’d recommend you buy an infinite position in the $700 to $1,300 range from a mobility company. How to Choose a Lift Chair? 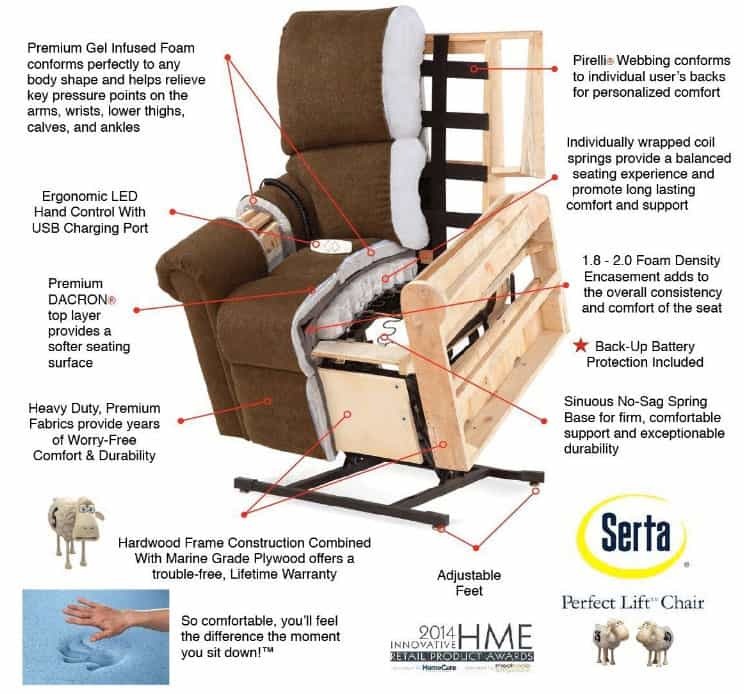 The experts at Med Mart show you how to choose a Lift Chair. Palliser lift chairs rise to the occasion with dependable steel mechanisms and powerful motors. Top quality materials ensure lasting comfort and durability. There are a lot of optional features available with each lift chair. Lift table – can be purchased for $100 to $200. These are tables designed to work with a lift chair. They are on wheels or a pivot so that you can move them around. Leather – some chairs have leather available as an upgrade. While fabric upholstery is standard, leather provides a lot of durability and looks great. Normal fabric upholstery is just fine for most individuals. Slipcovers – like all recliners, lift chairs can be fitted with slipcovers to protect the upholstery. The Merax lift chair has a modest look yet it can serve as one of the most comfortable recliner chairs while it can function as a reclining sofa chair as well. The wired remote control is easy to use, and the soft, comfortable PU leather is eco-friendly and stain resistant. Also, it doesn’t get too hot even if you sit on the chair for hours. 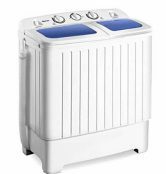 One of the best options when it comes to satisfying your need for comfort, easy lifting, and handy mechanism function. The ideal companion if you have some injury, belong to the elderly part of the population or have to deal with some form of disability. 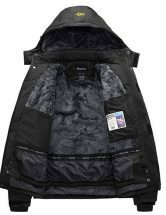 There is also a convenient recline function, a remote control that makes it easy to change different positions and it has a sew-in pocket. It features a three position electric lift and a built-in motor which can change from sitting down to a completely upright position. Among its highlights is how the seat and back cushions are zipped, which makes it easy to adjust and replace. There is also an integrated battery as an emergency backup. The sturdy construction is a plus for sure, as the power lift is made of steel. The padded arm and channel-tufted back design are some of the highlights of the Homelegance. It measures 31” x 36.5” x 42” H and can suit an average person. However, perhaps it is not ideal for a taller individual. An added advantage is how the chair can be easily cleaned in case of an accidental spill-over. Among its few disadvantages noted by consumers, is how the recline back and foot are not independent. How to Choose Best Lift Chairs? 1. Dimensions – The lift chairs are available in various sizes. You need to make sure that the chair fits for the person who will be using it. The seat of the lift chair needs to be wide enough to accommodate the person. Also, the feet needs to be placed on the floor while seated. 2. Weight capacity – Most of the lift chairs come with standard weight capacity. If you are looking for some exceptional capacity, you will have to make sure that the lift chair meets your requirements. 3. The fabric used – Lift chairs are constructed using various fabric materials like leather, micro-suede, etc. Though leather looks appealing, it might not be suitable if you live in a hot environment. The lift chairs made out of micro-suede is more comfortable but also more susceptible to stains. The best option is the ultra leather which is stain-resistant as well as resistant to changes in temperature. 4. Placement of the lift chair – The area where you will be using the lift chair at home also influences your selection. These chairs come with the various sliding mechanism. If you plan to place the lift chair against the wall, you should go for the ones that open in a forward position so that it will not hit the wall. 5. Additional features – If your budget permits, you can choose lift chairs with various add-on features. Some of them include the massage options, cup holders, removable armrests, extra pillows, tray tables, etc. Used Lift Chairs – Should You Buy? Lift chairs can be expensive. You might be tempted to purchase a used one. This might save you a bunch of money up front, but may not in the end. If you do find a used lift chair you are interested in, find out if there is still a warranty and whether or not it is transferable. Lift chairs rise off of the ground and tilt forward. All you have to do is wait until the chair has you in standing position, and then you can walk and go about your day. If you want a lift chair and a recliner sofa in one, then try the Merax Power Lift and Recliner chair, which is exceptionally comfortable. 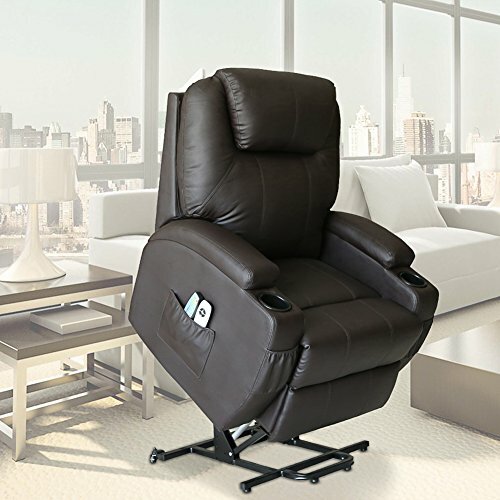 If you want a modern looking chair with built-in features like the cup holders, or the pocket, we recommend the ProLounger Lya Cream Renu Leather Power Recline. On the other hand, if you are looking for a good power lift chair overall which is very affordable, then the Coaster Furnishings is a great option. 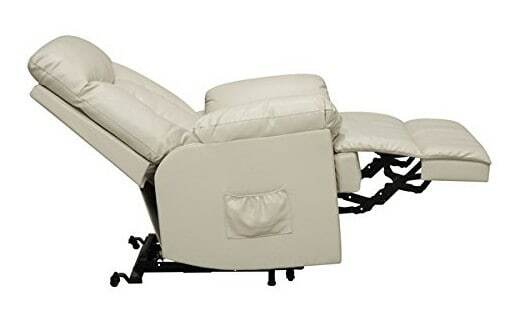 In case you are a massage lover, then don’t miss out on the Recliner Power Lift Chair by Outdoor Sunshine. 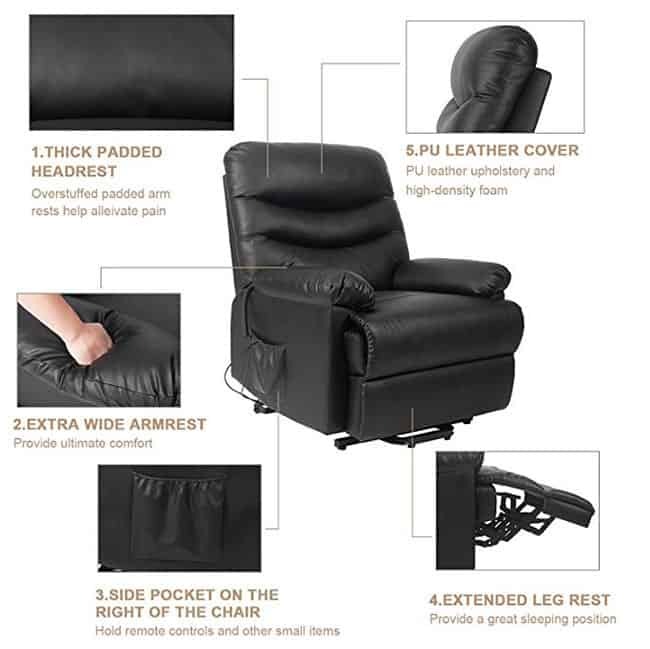 If you’re not sure which power lift recliner is best for you, here are a couple of guidelines. 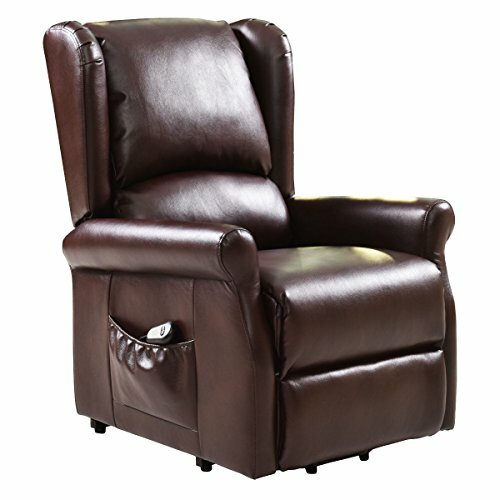 Some power lift recliners have the full lift option but only recline back slightly, while others can lay completely flat. 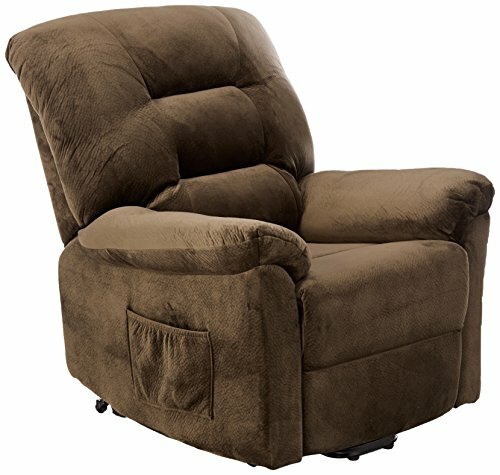 If you plan on using the power lift recliner all throughout the day and need something that you can also sleep in, a chair that reclines all the way back is the best option for you. Some chairs come with cup holders and storage pockets on the sides of the chair. This means you can have your drinks, remotes, magazines, etc. with you at all times. You have to make sure that the chair is near an outlet since it has to be plugged in to work. Distance from the wall is also something to consider, especially if you choose a recliner that can recline all the way flat. Some chairs have a “wall hugging” design, which means that they can be placed closer to the wall and still have space to recline. Assembly is also something you will need to consider, as none of these chairs arrive pre-assembled. Most chairs have an easy assembly as all you have to do is slide the back on to the base of the chair. However, the chairs can be heavy so make sure you have someone there to assist or set it up for you. 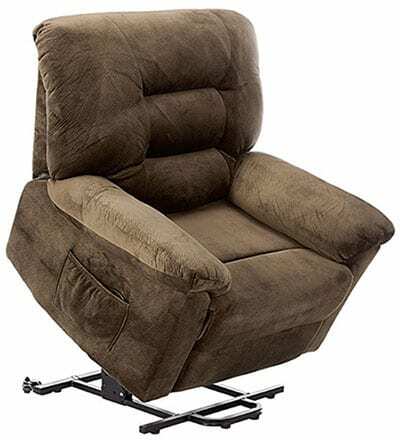 Power lift recliners are extremely helpful and can be a great addition to any living space.Operated with an internal motor, power lift recliners take out the difficult work of reclining and getting in and out of the chair with just a push of a button.